PTEN inactivation is the most frequent genetic aberration in endometrial cancer. One of the phosphatase-independent roles of PTEN is associated with homologous recombination (HR) in nucleus. Poly (ADP-ribose) polymerase (PARP) plays key roles in the repair of DNA single-strand breaks, and a PARP inhibitor induces synthetic lethality in cancer cells with HR deficiency. We examined the anti-tumor activity of olaparib, a PARP inhibitor, and its correlation between the sensitivity and status of PTEN in endometrial cancer cell lines. The response to olaparib was evaluated using a clonogenic assay with SF50 values (concentration to inhibit cell survival to 50%) in 16 endometrial cancer cell lines. The effects of PTEN on the sensitivity to olaparib and ionizing radiation (IR) exposure were compared between parental HEC-6 (PTEN-null) and HEC-6 PTEN + (stably expressing wild-type PTEN) cells by clonogenic assay, foci formation of RAD51 and γH2AX, and induction of cleaved PARP. The effects of siRNA to PTEN were analyzed in cells with wild-type PTEN. The SF50 values were 100 nM or less in four (25%: sensitive) cell lines; whereas, SF50 values were 1,000 nM or more in four (25%: resistant) cell lines. PTEN mutations were not associated with sensitivity to olaparib (Mutant [n = 12]: 746 ± 838 nM; Wild-type [n = 4]: 215 ± 85 nM, p = 0.26 by Student’s t test). RAD51 expression was observed broadly and was not associated with PTEN status in the 16 cell lines. The number of colonies in the clonogenic assay, the foci formation of RAD51 and γH2AX, and the induction of apoptosis were not affected by PTEN introduction in the HEC-6 PTEN + cells. The expression level of nuclear PTEN was not elevated within 24 h following IR in the HEC-6-PTEN + cells. In addition, knocking down PTEN by siRNA did not alter the sensitivity to olaparib in 2 cell lines with wild-type PTEN. Our results suggest that olaparib, a PARP inhibitor, is effective on certain endometrial cancer cell lines. Inactivation of PTEN might not affect the DNA repair function. Predictive biomarkers are warranted to utilize olaparib in endometrial cancer. Homologous recombination (HR) is a critical step for DNA repair, and certain types of cancers are HR defective, including BRCA1/2 deficiency [1, 2]. Poly (ADP-ribose) polymerase (PARP) plays a key role in the repair of DNA single-strand breaks (SSBs) , and PARP inhibition leads to the accumulation of SSBs, which results in the development of DNA double strand breaks (DSBs) via the collapse of replication forks [3–5]. Tumor cells lacking functional BRCA1 and BRCA2 are deficient in the repair of DSBs by RAD51-mediated HR, which leads to cell cycle arrest and/or cell death . Thus, targeting the HR defect, which is specific to cancer cells, and causing synthetic lethality by a PARP inhibitor is expected to be a promising therapeutic strategy in selected tumors . Indeed, a PARP inhibitor, olaparib (AZD2281/ KU0059436), showed antitumor activity in cancer patients, especially with the BRCA 1/2 mutations in breast and ovarian cancers [6, 7]. However, BRCA status alone is not necessarily the only predictive biomarker for effective olaparib treatment because various types of genes are known to be involved in the HR process, including PTEN, ATM, RAD51[8–10]. Therefore, PARP inhibition might be useful for various types of tumors with HR defects, independent of the BRCA status (BRCAness). Endometrial cancer is the fourth most common malignancy among women in the United States . In endometrial cancer, the constitutive activation of the phosphatidylinositol 3-kinase (PI3K) pathway is induced by various types of alternations, including frequent mutations of K-Ras (10–20%), PIK3CA (25–36%), AKT (2%), and PTEN (34–56%) [12–15]. Additionally, the loss of heterozygosity (30–40%) of the PTEN locus at chromosome 10q23.31 is also associated with the inactivation of PTEN [16–18]. In addition to a negative regulator of the PI3K/AKT signaling pathway, PTEN contributes to maintaining genomic stability and DNA repair processes by regulating the expression of RAD51, a key protein in HR DNA repair . The lack of PTEN also impairs CHK1 function, which results in the accumulation of DNA DSBs [20, 21]. Dedes and coworkers showed that PTEN-deficient endometrial cell lines, which fail to elicit RAD51 to DNA damage sites, are sensitive to PARP inhibitors . However, the correlation between PTEN status and RAD51 expression remains a debatable matter. For example, a recent study showed that PTEN deletion is not associated with the loss of RAD51 in prostate cancer cells . The purpose of this study is to clarify the anti-tumor effect of olaparib on a panel of endometrial cancer cell lines and to assess the association among PTEN status, HR repair, and sensitivity to olaparib in endometrial cancer cells. We used 16 endometrial cancer cell lines (Table 1). HHUA was purchased from RIKEN Cell Bank (Tsukuba, Japan). AN3CA, KLE, HEC-1B and RL95-2 were purchased from American Type Culture Collection (Manassas, VA). Ishikawa3-H-12 was a generous gift from Dr. Masato Nishida (National Hospital Organization Kasumigaura Medical Center, Japan). The other 10 cell lines were established by Hiroyuki Kuramoto . Histologically, only the HEC-180 cell line was classified as a serous adenocarcinoma; the other cell lines were classified as endometrioid adenocarcinomas. The culture conditions of the 13 endometrial cancer cell lines were described previously . HEC-180, HEC-251, and HEC-265 cells were maintained in Eagle’s MEM with 10% FBS. HEC-6 cells stably expressing wild-type PTEN were generated by a retroviral infection, as described previously . Phoenix cells were transfected with retroviral vectors (pFB-neo) that contained tandem affinity purification (TAP)-tagged wild-type PTEN using Lipofectamine 2000 (Invitrogen, Carlsbad, CA) and the resulting supernatants were used to infect HEC-6 cells. Drug selection was used to purify cell populations after infections by neomycin (500 μg/mL, 7 days). Olaparib (AZD2281/KU0059436) was provided by AstraZeneca (London, UK). Olaparib was solved in DMSO, and the concentration of DMSO in each assay was 0.1%. Cells were plated at approximately 30% confluence in 100-mm plates and incubated for 24 h before transfection with small interfering RNA (siRNA) duplexes at the concentrations indicated, using Lipofectamine 2000 RNAiMAX (Invitrogen, Carlsbad, CA) and Opti-MEM medium (Life Technologies, Grand Island, NY). The target sequence of siRNA specific for PTEN was described previously . A negative control kit was used as a control (Invitrogen, Carlsbad, CA). HA-tagged wild-type PTEN expression plasmid was generated and transfected into PTEN mutant cell lines using Effectene transfection reagent (Qiagen, Valencia, CA, USA). HA-tagged pcDNA plasmid was used as a control. The mutational status of PTEN (exons 1–9) was analyzed by PCR and direct sequencing as described previously . The mutational status in 13 of the 16 endometrial cell lines and the PCR primers have been described previously [12, 24]. The mutational status in the remaining three cell lines (HEC-180, HEC-251, and HEC-265) is presented in Table 1. Cells were lysed as described previously [12, 25]. Antibodies specific for PTEN (138G6), phospho-PTEN (Ser380), AKT (Cell Signaling Technology), phospho-AKT (Ser473), PARP, cleaved PARP (Cell Signaling Technology, Beverly, MA), RAD51 (Millipore, MA, USA and Santa Cruz Biotechnology, CA, USA), and β-actin (Sigma-Aldrich, MO, USA) were used for western blotting, as recommended by the manufacturer. Proteins were visualized using an ECL western blot detection kit (GE Healthcare, Little Chalfont, UK). Immunocytochemistry was performed as described previously . Primary antibodies to RAD51 (Millipore, MA, USA) (1:500 dilution) and γH2AX (Millipore, MA, USA) (1:500 dilution) and secondary antibodies to Alexa Fluor 488-conjugated chicken anti-mouse IgG and Alexa Fluor 568-conjugated goat anti-rabbit IgG (Invitrogen, Carlsbad, CA) (1:100 dilution) were used for analysis. Nuclei were visualized by staining with DAPI. The slides were briefly counterstained and analyzed by confocal fluorescence microscopy (Carl-Zeiss MicroImaging Inc., Oberkochen, Germany). The number of RAD51- and γH2AX-foci was evaluated in a mean of 100 cells. Cell cycle analysis was performed by flow cytometry, as previously described . The cells were exposed to olaparib (10 μM) for the indicated time or were irradiated with 10 Gy after 24 h of irradiation. The cell cycle distribution was analyzed using CELL Quest pro ver. 3.1. (Beckman Coulter Epics XL Brea, CA). All experiments were repeated three times. Cells were seeded in six-well plates at a concentration of 2,000 cells per well with olaparib (10 nM to 100 μM) or IR (2 Gy to 6 Gy). Cells were continuously exposed to olaparib with media during the incubation. After 14–21 days of incubation, the cells were fixed with methanol and stained with Giemsa (Wako). All experiments were repeated three times and the SF50 (surviving fractions at 50%) values, which indicate the concentration required to inhibit cell survival to 50%, were calculated by proliferation curves. Cells were irradiated using a Shimadzu PANTAK HF-350 X-ray generator (1.0 mm Al +0.5 mm Cu filter; 200 kVp; 20 mA; Shimadzu, Kyoto, Japan). Data are expressed as the means ± standard deviations of three independent determinations. The significance of differences between the two samples was analyzed using Student’s t-test, and a p-value of <0.05 was considered to denote a statistically significant difference. PTEN mutations were detected in 12 of the 16 (75%) endometrial cancer cell lines (Table 1). PTEN mutations were not observed in four cell lines (HEC-1B, HEC-50B, KLE, and HEC-180). Among the 12 cell lines with PTEN mutations, the expression of PTEN was observed in the HEC-116, HEC-88, HEC-151, and HEC-251 cell lines (Figure 1A). RAD51 expression was detected in all 16 cell lines. Although the determination of the expression levels was beneficial, RAD51 expression was not affected by either PTEN mutation or loss of PTEN expression (Figure 1A). Correlation between PTEN status and RAD51 expression in endometrial cancer cell lines. (A) PTEN and RAD51 expression (western blot) in a panel of 16 endometrial cancer cell lines. Cell lines with a PTEN mutation are denoted as (●). (B) Establishment of the HEC-6-PTEN + cell line. Levels of PTEN, total/phosphorylated AKT, and RAD51 were evaluated by western blot analysis. 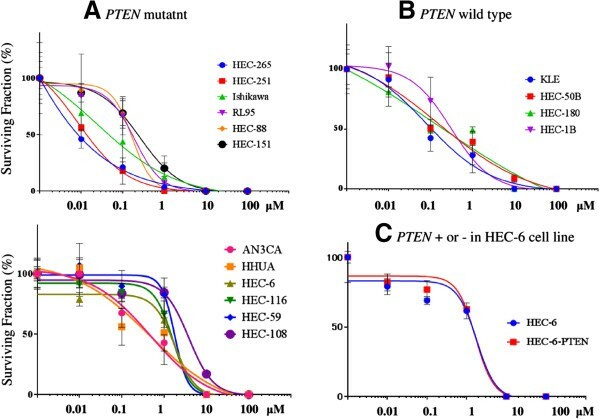 We generated a stable endometrial cancer cell line expressing wild-type PTEN (HEC-6 PTEN+) by introducing wild-type PTEN into a parental HEC-6 (PTEN null) cell line. 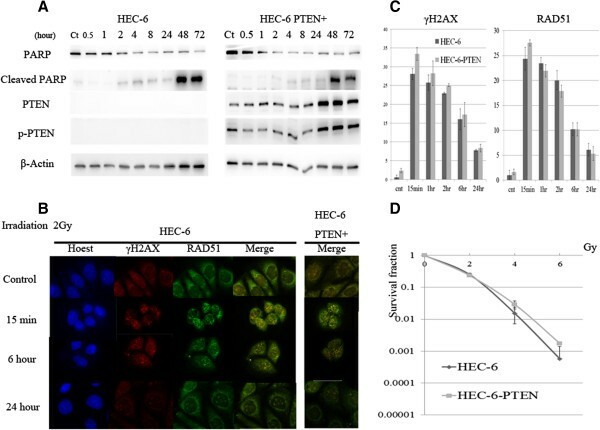 The expression of exogenous PTEN was confirmed (Figure 1B) and the phosphorylation level of AKT (Ser-473) was decreased by PTEN introduction in HEC-6 PTEN + cells (Figure 1B), which suggests that the PI3K signaling is affected by wild-type PTEN. However, the expression of RAD51 was not increased by the introduction of PTEN (Figure 1B). Thus, RAD51 expression is indicated to be regulated in a PTEN-independent manner in endometrial cancers. 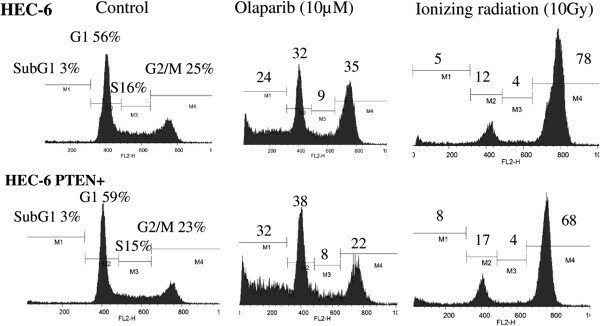 We tested the anti-proliferative effects of olaparib in each of the 16 endometrial cancer cell lines by clonogenic assay under incubation of 14–21 days with continuous exposure to oraparib (Figure 2A and 2B). The SF50 values with olaparib varied from 8 nM to 2,500 nM (Table 2, Figure 2A and 2B). Four of the 16 (25%) cell lines demonstrated SF50 values at 100 nM or less, whereas 4 of the 16 (25%) cell lines exhibited SF50 values at 1,000 nM or more. Unexpectedly, the SF50 values were not significantly distinct between the PTEN mutant and PTEN wild-type cells (p = 0.26 by Student’s t test). Additionally, the lack of PTEN expression did not increase the sensitivity to olaparib (p = 0.27; Table 2). In the HEC-6 PTEN + cells, the SF50 value with olaparib was 1,500 nM, which was comparable with the SF50 value in the parental HEC-6 cells (Figure 2C). Status of PTEN in endometrial cancer cells is irrelevant to the response to olaparib. (A) (B) Each cell line was treated with 5 concentrations of olaparib, and the cell proliferation was evaluated by a clonogenic assay. Cells were cultured for 14–21 d. Cells were continuously exposed to olaparib with media during the incubation. All experiments were repeated 3 times, and each value is shown as the mean of 3 experiments ± SD. PTEN mutant cells (n = 12) are shown in (A: 6 cells in upper left and the other 6 in lower left), and wild-type cells (n = 4) are shown in (B). (C) Clonogenic assay comparing HEC-6-PTEN + cells with parental HEC-6 cells. SF50 values were 1,800 nM in both cell lines. SE: Standard Error, SD: Standard Deviation. We also examined the effect of PTEN in other cell lines. Knocking down PTEN by siRNA in two cell lines with wild-type PTEN (HEC-1B and HEC-50B) did not affect the sensitivity in clonogenic assay (Additional file 1: Figure S1A). In addition, introduction of wild-type PTEN plasmid (pcDNA3-HA-PTEN) into a PTEN mutant cell line (AN3CA) did not alter the sensitivity, compared with the control (Additional file 1: Figure S1B). These results suggest that accumulated DSB, following PARP inhibition by olaparib, successfully induces anti-proliferative effects in specific endometrial cancer cell lines and that PTEN status is not a useful biomarker to predict the effectiveness. 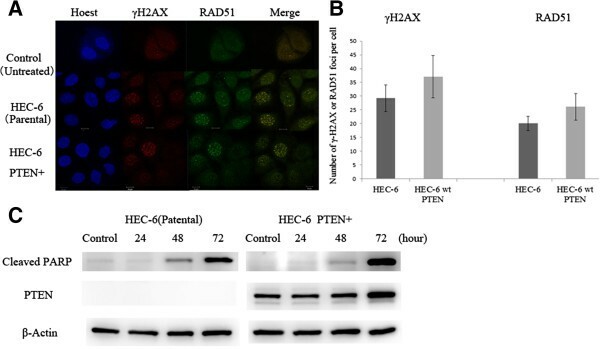 Nuclear foci of γH2AX and RAD51 were evaluated by immunofluorescence to observe responses to DNA damage in the parental HEC-6 and the HEC-6-PTEN + cells. The exposure to olaparib (10 μM) for 24 h induced foci formation of both γH2AX and RAD51 in the nuclei (Figure 3A). The number of γ-H2AX or RAD51 foci per cell was not significantly distinct between the parental HEC-6 and the HEC-6-PTEN + cells (Figure 3B). Since PARP cleavage is an important apoptosis marker, we evaluated whether the cleavage is distinct between the two cell lines. Following the exposure to olaparib (10 μM), cleaved-PARP was induced after 48 h and the induction level was increased after 72 h in the HEC-6 cells (Figure 3C). The level of cleaved-PARP was also comparable between the HEC-6 and HEC-6-PTEN + cells (Figure 3C). These data suggest that the expression of wild-type PTEN also does not affect apoptosis induction in HEC-6 cells. γH2AX and RAD51 foci formation in HEC-6 cells after olaparib treatment. (A) Immunofluorescence images of PTEN-/+ HEC6 cell lines: Hoechst-stained nuclei (blue), γ-H2AX (red), and RAD51 (green) after olaparib exposure (10 μM) for 24 h. (B) The number of γ-H2AX and RAD51 foci following exposure to olaparib (10 μM) was counted in the HEC-6 cell lines. The experiments were repeated 3 times, and each value is shown as the mean of 3 experiments ± SD. (C) Time course expression of cleaved PARP and PTEN in PTEN-/+ HEC-6 cell lines. Proteins were extracted after 24 h of olaparib (10 μmol/L) exposure. Parental HEC-6 and HEC-6-PTEN + cells were exposed to IR at 10 Gy as a DNA damaging agent. The expression of PTEN, as well as the phosphorylation level of PTEN (Ser-380), was increased in HEC-6 PTEN + cells within 24 h following IR exposure (Figure 4A). Following the IR exposure, cleaved PARP was induced after 48 h, regardless of the presence of PTEN in these cells (Figure 4A). Using immunofluorescence, foci formation of γ-H2AX and RAD51 was observed following 2 Gy of IR exposure in both cell lines. The foci of these two proteins in the nuclei were induced within 15 min and continuously observed even after 6 h; the foci dispersed within 24 h (Figure 4B). The number of γ-H2AX and RAD51 foci was comparable between the parental HEC-6 cells and the HEC-6 PTEN + cells (Figure 4C). In addition, the clonogenic assay revealed that the cell survival fraction after IR exposure was not significantly distinct between the two cell lines at each dose tested (Figure 4D). Response to IR in HEC-6 PTEN + and parental HEC-6 cell lines. (A) Total/cleaved PARP and total/phospho-PTEN expression in HEC-6 PTEN + and parental HEC-6 cell lines were examined by western blot analysis. Proteins were extracted after 10 Gy of IR at the indicated times. (B) Immunofluorescence images of PTEN-/+ HEC-6 cell lines: Hoechst-stained nuclei (blue), γ-H2AX (red), and RAD51 foci (green) after IR exposure (2 Gy). (C) The number of γ-H2AX and RAD51 foci following exposure to IR (2 Gy) was counted in the PTEN-/+ HEC-6 cell lines. The experiments were repeated 3 times, and each value is shown as the mean of 3 experiments ± SD. (D) Clonogenic assay in the PTEN-/+ HEC-6 cell lines after exposure to IR at the indicated doses (2–6 Gy). Lastly, cell cycle analysis following exposure to olaparib (10 μM, 72 h) or IR (10 Gy, 48 h) was performed by flow cytometry in the HEC-6 and HEC-6-PTEN + cells. The sub-G1 population was markedly increased in both cell lines by either olaparib or IR (Figure 5). Although the population of G1, S, and G2/M phase was distinct between olaparib- and IR-treated cells, each population was comparable between the HEC-6 and HEC-6 PTEN + cells by either exposure. These data indicate that the cytotoxic and cytostatic effects of olaparib and IR were induced in a PTEN-independent manner in the HEC-6 cell lines. Cell cycle population was not affected by PTEN status in the HEC-6 endometrial cancer cells. Cell cycle populations following exposure to olaparib (10 μM, 72 h) or IR (10 Gy, 48 h) were determined by flow cytometry in PTEN-/+ HEC-6 cell lines. Inhibiting PARP is a promising strategy in cancer cells, especially in cells with a deficiency in HR repair. Although BRCA1/2 play key roles in HR repair, the association of other tumor suppressor genes with HR repair is still debatable. In phase II clinical trials conducted in high-grade serous ovarian carcinomas, olaparib has been reported to be effective in certain patients without BRCA1/2 mutations [27, 28]. The activity of olaparib (AZD2281, KU0059436) was demonstrated by Menear et al. . The IC50 of olaparib (Compound 47 in the paper) was shown to be 6 nM and exposure to 100–300 nM olaparib inhibited PARP activity (quantified by a PAR formation) by 90–95% . In addition, poly (ADP-ribose) expression was sufficiently suppressed by 1 μM or higher doses of olaparib, regardless of the SF50 values (ranging from 200 nM to 4,500 nM) . Preclinical studies have suggested that PTEN deficiency causes HR defects and possibly induces sensitivity to PARP inhibitors . Therefore, the inactivation of PTEN in cancer cells might be one of the possible mechanisms of HR defects independent from BRCA. In this study, using a panel of endometrial cell lines, we focused on (i) the anti-tumor effect of olaparib and its relationship with PTEN status, (ii) the association between PTEN and HR-related proteins (RAD51 and γ-H2AX), and (iii) the relationship between PTEN status and the response to IR exposure (another DNA damaging therapy). Clonogenic assays revealed that sensitivity to olaparib is greatly distinct among endometrial cell lines, with SF50 values ranging from 8 nM to 2,500 nM. The high ratio (25%) of sensitive cells with SF50 values <100 nM suggests that endometrial cancers are good candidates for PARP inhibitors such as olaparib. Recently, the possibility of a relationship between PTEN status and sensitivity to PARP inhibitors has received much attention [3, 22, 30]. Dedes et al. reported that PTEN-deficient cells were more sensitive to a PARP inhibitor than PTEN-wild type endometrial cancer cells . However, our results were not in agreement with their conclusion. In our study, the existence of PTEN mutations did not result in high sensitivity to olaparib. One of the 4 PTEN wild-type cells and three of the 12 PTEN mutant cells were classified as sensitive (SF50 ≦ 100 nM). Moreover, all the 4 resistant cell lines (SF50 > 1,000 nM) were PTEN mutant. The report by Dedes et al. included only 2 PTEN wild-type cell lines (HEC-1B and EFE-184), whereas 4 PTEN-wild type cell lines were included in our study. All the SF50 values in these 4 cell lines were 340 nM or lower. In addition, they did not include 3 of the 4 “resistant” (and PTEN mutant) cell lines in this study (HEC-6, HEC-116 and HEC-108) . The contribution of PTEN inactivation was also negatively reported in prostate cancer cell lines (22RV1, DU145, and PC3) . Therefore, we further examined the relationship between PTEN and HR-related proteins in endometrial cancer cells. RAD51 mediates the formation of DNA joints that link homologous DNA molecules . Several recent reports have suggested that the loss of PTEN might be associated with the downregulation of RAD51 [19, 33]. Our data suggest that RAD51 expression levels were not associated with the PTEN status in a panel of endometrial cells and that the introduction of PTEN does not upregulate RAD51 expression in HEC-6 cells. Dedes et al. reported that expression of RAD51 was not associated with the status of PTEN, and that RAD51 expression was predominantly observed in cytoplasm, not in nucleus . These data are compatible with previous reports in astrocytes and prostate cancer cell lines [22, 30] but not in agreement with reports in colorectal cancer cells . Thus, the association of RAD51 and PTEN might be distinct among various types of tumors. One of the earliest events in the signal transduction cascade initiating DSBs is the phosphorylation of serine 139 of histone H2AX (γH2AX) and RAD51 filament formation on DNA [34, 35]. Our data showed that foci formations of γ-H2AX and RAD51 after olaparib exposure did not differ between parental HEC-6 and HEC-6-PTEN + cell lines. The data was also in agreement with the previous report that phospho-γ-H2AX foci formation by exposure to PARP inhibitor was not associated with PTEN status . In previous reports, a PARP inhibitor induced G2/M arrest, which led to cell death [36, 37]. In our study, olaparib induced both G2/M arrest and cleaved PARP expression in HEC-6 cell lines after 24 and 48 h of olaparib and IR exposure. It is crucial to note that these events are independent from PTEN status. Therefore, the response to olaparib-induced DNA damage is suggested to be independent from PTEN in endometrial cancer cells. Although PTEN deficiency was proposed as a predictive biomarker to PARP inhibition, our data with clear phenotypic change by olaparib but no impact of PTEN status suggests that PTEN is unlikely to be a predictive biomarker to PARP inhibitors in endometrial cancer. We also examined whether the response to IR-induced DNA damage is affected by PTEN status. IR directly produces DNA DSBs . After IR exposure, γH2AX and RAD51 foci formation was not significantly different between the parental HEC-6 cells and the HEC-6-PTEN + cells. Additionally, the cell cycle profile and cell proliferation were also not affected by exogenous PTEN when examined using flow cytometry and clonogenic assays. The response of RAD51 to IR exposure was similar in the endometrial cells without PTEN mutations. Our study has some limitations. Predictive biomarkers for olaparib are still unknown. Further studies are warranted to elucidate whether PTEN inactivation is a biomarker for resistance to olaparib. The role of PTEN might be distinct when a PARP inhibitor was administered in combination with another drug (or irradiation), as the combination of a PARP inhibitor with cisplatin or irradiation was reported to be effective in PTEN deficient cells [39, 40]. Additionally, the mechanism of RAD51 expression should be elucidated further. xIn conclusion, our findings have noteworthy implications: PTEN inactivation is not a good biomarker of olaparib treatment and PARP inhibitors might still provide a promising therapeutic strategy in certain endometrial carcinomas. We thank Keiko Shoji, Michihiro Tanikawa, Yuichiro Miyamoto, Kensuke Tomio, and Satoko Kojima for their support and assistance. We also thank Masato Nishida for generously providing the Ishikawa cells. This work was financially supported by The Grant-in-aid for Scientific Research (C), Grant Number 23592437 from the Ministry of Education, Culture, Sports, Science and Technology of Japan (to K Oda). This study was also performed as a research program of the Project for Development of Innovative Research on Cancer Therapeutics (P-Direct), Ministry of Education, Culture, Sports, Science and Technology of Japan (to T Yano). AM performed the experiments and wrote the manuscript. KO (corresponding author) supervised the experiments and wrote the manuscript. YI wrote the manuscript. OH-W, TK, TK, TF, KI, KS, YU, RK, KN, YM, TA, SN, TY, KK, YO, and TF contributed reagents, materials, experimental techniques, and data analysis. AE, NH, and KM contributed experiments using IR. HK established 11 HEC endometrial cancer cell lines. All authors read and approved the final manuscript.